A most unexpected circumstance arose last Sunday: I was allowed to take pictures of the hotel in which I work. Conrad Tokyo is a very lavish place where employees are servants to the guests at all times, and this is further reinforced by Japanese culture that tends to take customer service rather seriously. So just as common sense says that attempting to breathe while submerged underwater is a bad idea, also here it is simply understood that employees don’t engage in silly activities like snapping pictures of their workplace. I can’t even come into the hotel on a day off and commit the crime then . . . because it’s still a crime. Well, a blatant violation of common sense, at any rate. 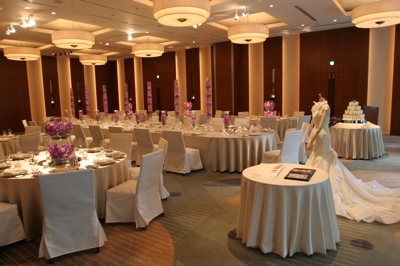 However, instead of wedding ceremonies, Sunday was host to a “bridal fair,” which was like an open house for wealthy couples to visit the hotel, be doted upon, and be persuaded to get married at Conrad Tokyo themselves. 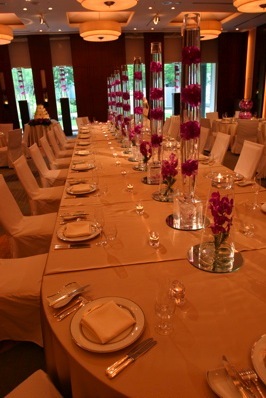 The two banquet halls where specially set up for this occasion, and the hotel requested Atelier ONE to photograph them. (My hotel holds its nose so high in the air that brand names shared with other hotels can’t reach it, so the branch of Sato Photo Co., Ltd. located here is disguised by an exclusive heading.) My boss kindly handed me a digital, single-lens-reflex camera with a $1500 lens and let me have some fun taking whatever pictures I wanted in the banquet rooms. I would be lying to say that I don’t wish my job normally included this kind of activity. I left that day with a few pictures I’d taken of the smaller banquet hall on my computer—that is, the normally unobtainable photos had crossed the point of no return to going up on my blaug. It’s unfortunate that I don’t have more to share, but every shot is one more than common sense says I’m allowed to have. Pretty grand. The larger banquet room upstairs is even grander, though. Flowers floating in midwater. I’d say that there’s more glass than any other material on these tables. 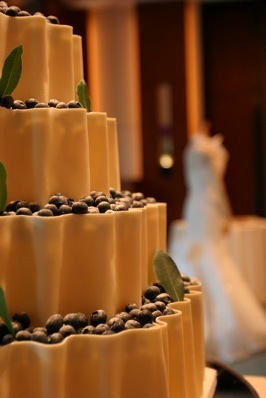 Ah, a sample wedding dress and cake. How about the mannequin look for your wedding? Yeah, that camera was a lot of fun to take pictures with. As I get more accustomed to the system here, maybe I’ll learn how to exploit it and use the digital cameras for my own illicit enjoyment from time to time. I love that, once one has the equipment, digital photography is free. Recently I got a free lunch, too. The president of Sato Photo, his wife, and their two sons (all of whom are involved in running the company) officially welcomed me to their operation by taking me out to lunch at a small sushi restaurant called Matsukan (まつ勘). They said that it’s the place to which they always go for sushi, which was enough for me to assume that it was both good and expensive. Matsukan is a very small place, as you can see in these pictures—well known only by word of mouth. It was, in fact, the best sushi I’ve ever had: impeccably fresh, immaculately portioned, and slightly seasoned where appropriate. It even looked pretty. Had I not been with such important people, I would probably have brought my camera and taken pictures. But in the photography business, I might say, knowing when not to take pictures is as important as actually taking them. Sato Photo isn’t a gigantic company, and so running into the president and his family isn’t rare like I’d expect. He and one of his sons were at my photo studio on the morning of the bridal fair, for example. They showed up when my boss was attempting to get a DVD player and a projector to play a demo video of how great Atelier ONE can make its customers look. (We outsource people from a company called Aetus every week to create videos of the weddings.) But no matter what my boss tried, and the president’s son after him, the video just wouldn’t appear on the screen. They left to seek help, and I started playing around with the Japanese projector while the big cheese sat back and watched. In about 30 seconds it was all working as intended. Sure, it was neat to do the right thing in the president’s presence, though I doubt it counted for anything. But it made me wonder, as I have before: Why have I not pursued some kind of study or job dealing with computers and related technology? I think so literally and, perhaps, logically that programmed devices are naturally easy for me to manipulate. While my boss is on the phone asking for help, I don’t hardly have to think to make the machine work. Surely there is some use for this way of thinking beyond the ability to treat people like Spock or Data, right? These kinds of thoughts came into my mind also because I was weary from the previous day of shooting four weddings. 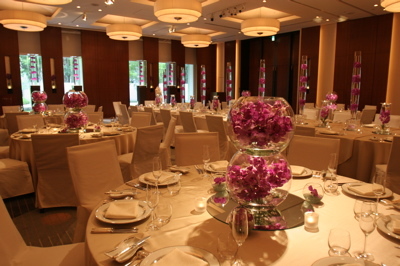 Conrad Tokyo hosts up to four on a given Saturday or Sunday, which is actually less than other hotels. Atelier ONE has just one studio photographer, though, so it ends up being a lot of work. Setting up lights and cameras, taking them back down, trying to remember methods and techniques, coming under the invisible pressure of needing to speedily please wealthy people who are spending a small fortune on their wedding—it’s tiring work. Sometimes I just have to stand around in guest territory for awhile, which of course means the only thing permissible is a rigid, formal-looking, uncomfortable stance that makes me regret having feet. In time both my body and my brain will get used to this routine, I am sure. It is important that I be patient. When I’m surrounded by the challenges of this internship or by the things that I don’t particularly like about being in Japan, I find it easy to wish that I were back home with people I miss. But Peter Jackson once said, as he was making his Lord of the Rings films, that although there were times when he was tired of it, he knew that working on these movies is what he’d wish he were doing if he were anywhere else. And the same is true for me. Thankfully I have not lost sight of the incredible blessing that this time in Japan is despite the hard times (or because of them). I call it a blessing even in the face of the company’s holiday system, which I think is kind of stingy. Employees get a maximum of 105 days off per year—that’s counting weekends, holidays, vacation days, whatever. (I’m not certain whether sick days are included.) Over 28% of the year is time off, which maybe sounds like a lot. But if there are 52 weeks in a year (there are, in fact), and if two days per week are non-working days, then 52 × 2 = 104 regular days off. So Sato Photo employees are allowed two days off per week and one additional day per year, which works out to be New Year’s Day or something like that. If they want to take off more than two days in a row, then they must save up time by not taking weekends and by working overtime. My boss confirmed that most Japanese companies aren’t this stingy, but also that most Sato Photo employees realistically get about 90 days off per year. I’m the exception who’s entitled to all 105. A blessing that is. Two final points of interest will bring an end to this entry. One is some pictures from the day I spent with friends from Hakodate, which are on a separate page. And the other is that I got a personal seal, or a small, circular stamp engraved with my “last name.” This is an important form of identification or authorization in Japan, and I was told that it’s necessary for opening a bank account here (which I can’t quite do yet . . .), among other things. I could have had my name engraved in katakana, the syllabary used for foreign words, but I also had the option to select Chinese characters. The latter seemed much more interesting to me, so that is what I did. 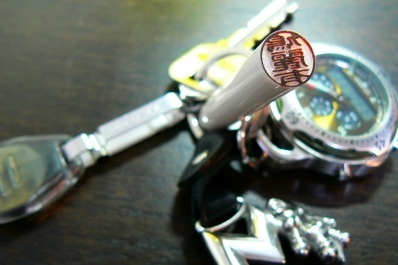 I used my key ring to hold the cylindrical seal in place. The characters on the end are both compressed vertically and reflected horizontally. I have chosen these characters to be read Kuriari, which is how “Cleary” sounds in Japanese. Together they mean, “There is a beautiful dove,” which does include special meaning for those so inclined. 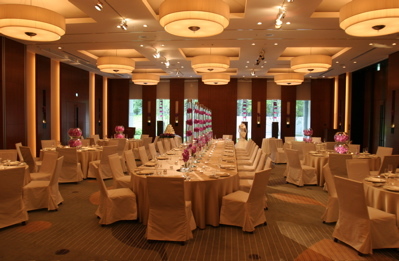 Both of the banquet halls have names: The smaller is Hamarikyū (浜離宮), and the larger is Kazanami (風波). These names were chosen by a non-Japanese person, and it shows, which I’ll explain. In Japanese culture it is inappropriate to give wedding gifts that could suggest bad ideas about the couple’s relationship. For example, knives and scissors are not okay because they can cut, and that suggests splitting up. In the same way, the two banquet hall names are ill-fitting because they don’t carry the best meaning for marriages.  The second character in Hamarikyū is 離, which means “separation” and is the first character in the word “divorce” (rikon, 離婚). And then the two characters in Kazanami mean “wind and waves,” which rather fails to conjure an image of a calm and peaceful relationship. The date shown here is when I started this entry. It was not until several days later that I was actually able to upload it. The amount of time I have to work on this thing each day is pathetically small—or often none at all.